The story here is obviously the Alex Gordon errors. Soon after its mid-February release, many collectors attempting to build 2006 Topps Series I sets were asking the same question - "Where the hell is #297?" It appeared that the product had been shipped without the card. Topps quickly acknowledged the situation saying "Topps acknowledges that the recently released 2006 Topps Baseball Series I... will have a missing card number." 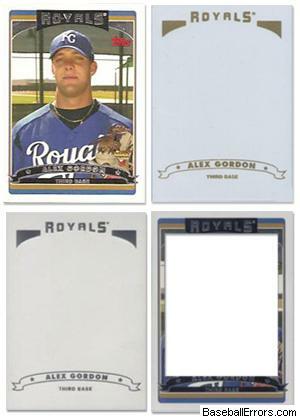 The story goes that Gordon, who had yet to make his Major League debut, could not be featured in a standard issue set. Topps had to comply with this rule pursuant to its agreement with the MLBPA. But as early as late-February collectors began pulling from packs a Frankenstein-esque assortment of Gordon cards. Die-cut versions... blank versions with different foil stampings... and, perhaps most incredibly, full uncut copies of the card that didn't exist.